eaT 54 w e s t w o r l d A l b e r t A | f a l l 2 0 1 4 (ToP) LUKE fANdrICH A FINE BLEND Multiple-varietal wines come of age s ingle-varietal wines will never fall from favour, but there's a new trend toward blends. Read on for three outstanding examples from Marty Park of Calgary's San Remo Ristorante – a new AMARewards partner – where the extensive wine list consists of around a third blends. 2012 Carpineto Dogajolo: is is a "Super Tuscan," or non-traditional blend of grapes – in this case, Cabernet Sauvignon with Sangiovese. It's "fruity and intense with fl avours of cherry, vanilla, coff ee and spice," says Park. is wine's big fruit will stand up to Cambozola cheese or braised beef. Sokol Blosser Evolution: is wine from Oregon illustrates the complexity and textures of blends, says Park. Its nine white varietals make for a tropical fruit fl avour that's delicious on its own or matched with mussels or roasted chicken. 2008 Tedeschi Amarone: is blend from the Veneto region of Italy is made from Corvina, Corvi- none and Rondinella grapes. As with all amarone wines, the grapes are picked and left to dry for a few months before crushing. is results in a dry wine with notes of cherry and currant, and a raisiny character. Sip it with antipasti or a hearty meal. 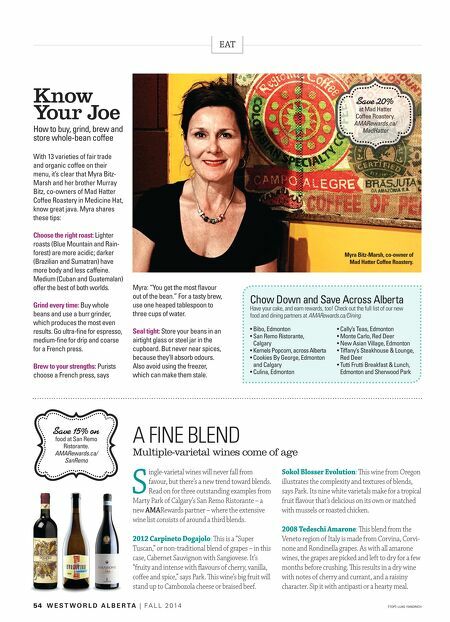 Know Your Joe How to buy, grind, brew and store whole-bean coffee With 13 varieties of fair trade and organic coffee on their menu, it's clear that Myra Bitz- Marsh and her brother Murray Bitz, co-owners of Mad Hatter Coffee Roastery in Medicine Hat, know great java. Myra shares these tips: Choose the right roast: Lighter roasts (Blue Mountain and Rain- forest) are more acidic; darker (Brazilian and Sumatran) have more body and less caffeine. Medium (Cuban and Guatemalan) offer the best of both worlds. grind every time: Buy whole beans and use a burr grinder, which produces the most even results. Go ultra-fi ne for espresso, medium-fi ne for drip and coarse for a French press. Brew to your strengths: Purists choose a French press, says Myra: "You get the most fl avour out of the bean." For a tasty brew, use one heaped tablespoon to three cups of water. seal tight: Store your beans in an airtight glass or steel jar in the cupboard. But never near spices, because they'll absorb odours. Also avoid using the freezer, which can make them stale. Save 20% at Mad Hatter Coffee Roastery. AMARewards.ca/ MadHatter Chow Down and Save Across Alberta Have your cake, and earn rewards, too! 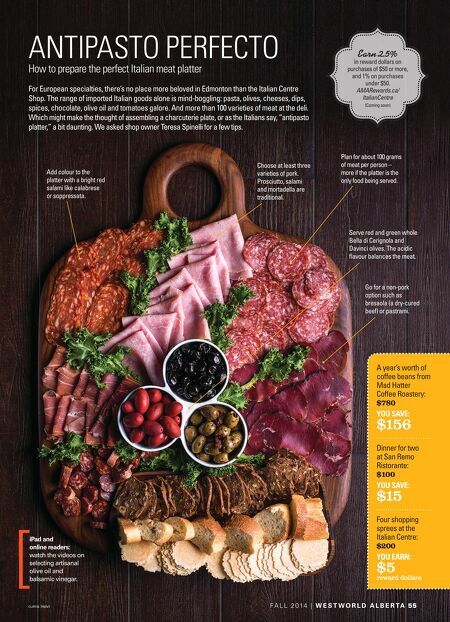 Check out the full list of our new food and dining partners at AMARewards.ca/Dining. • bibo, Edmonton • San Remo Ristorante, Calgary • Kernels Popcorn, across alberta • Cookies by George, Edmonton and Calgary • Culina, Edmonton • Cally's teas, Edmonton • Monte Carlo, Red Deer • new asian Village, Edmonton • tiffany's Steakhouse & Lounge, Red Deer • tutti Frutti breakfast & Lunch, Edmonton and Sherwood Park Save 15% on food at San Remo Ristorante. AMARewards.ca/ SanRemo Myra Bitz-Marsh, co-owner of Mad Hatter Coffee roastery.